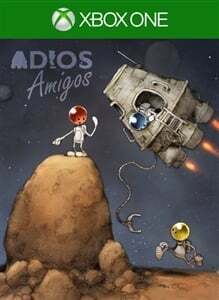 Welcome to the peculiar universe of ADIOS Amigos. A game with serious astrophysics in a comic setting for 1-4 players. Explore solar systems in the quest to find your home in this space physics odyssey. The Cosmic Clockwork In ADIOS Amigos the simulation controls everything. Nudge an asteroid with your ship and it might come crashing down on you as you walk around on a planet minutes later. Day and night cycles are caused by the planets rotations and we even simulate temperature and air resistance. The player is free to do anything within the confines of the simulation. You can... •	...spontaneously exit the ship inside a busy asteroid field! •	...fly to the sun and melt your ship! •	...tow a giant mushroom and put it in orbit around the sun! •	...ride a sofa into a black hole! Only your failures and imagination set the limits! Rookie Mode With Rookie mode it is possible for players of different skill levels to play together. Parents can play with their young children. Or gamers can play with their less talented parents and siblings. We want the whole family to be able to play ADIOS Amigos together. Rookie mode makes the controls easier and stops the player from doing obviously dangerous things. Features •	Local co-op multiplayer for 1-4 players. •	Dynamic split screen keeps the screen estate to a maximum for all four players. •	Three campaigns that can be played cooperatively or single player. •	Rookie mode for young children or inexperienced gamers. •	Procedurally generated solar systems filled with planets, space-stations, aliens and artifacts. •	Detailed physical simulation of entire solar systems including gravity, temperature, and atmosphere. •	Funky soundtrack. With saxophone solos! •	No weapons or killing (horrible accidents may occur).